Regimental CSM: Who are we? 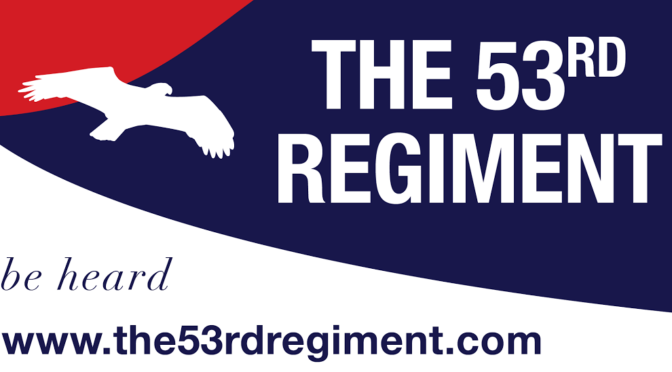 Regiment: The 53rd Regiment, the Fightin’ Herd! Regimental CSM: What is our motto? Regimental CSM: Sir, the Regiment is formed. Regimental Commander: Sergeants Major, Post! Since our inception, the 53rd Regiment has published 77 scholarly articles focused on the challenges of our time. We have had over 4300 web traffic hits on our articles and over 100 comments made largely endorsing views. Our numbers are growing, our message is strong and we will Be Heard! We have covered the failure of the current administration to prosecute the war against Radical Islam & terror. We have covered the corruption of our government covering up the Clinton lies, Benghazi, Clinton compromise of classified information, the Iranian Nuke scandal and the federal government targeting conservative groups through the IRS. The 53rd Regiment has covered the Pope, the Trump phenomena (Colon Blow I & II), the National Football League, the Democratic Party’s War on Women, Abortion, and we have honored our Veterans and troops that have sacrificed for our country. Showing the tremendous depth of interest of the 53rd Regiment members, some of our scholar/authors have even covered Roofman (A Dayton, OH) phenomena; Lawn Mowing in the modern world; Landau Rooftops and their impact on America culture; and most recently Coulrophobia and the Dark Clowns terrorizing our cities and towns. To my writers, my authors, members of The Herd, you have Been Heard! To the 53rd Regiment community of interest, you have Been Heard! To our enemies and those that wish the 53rd Regiment ill will, the Fightin’ Herd is always on guard and we will Be Heard! Our numbers are growing, readership is growing and new authors are being added to our ranks each day! The message is strong, our conservative press credentials are right and our message is Being Heard! Regiment, I am proud to lead you each and every day. We will not be denied. We will lead, we will be a positive example to our fellow Americans and you know one thing for certain, We Will Be Heard!